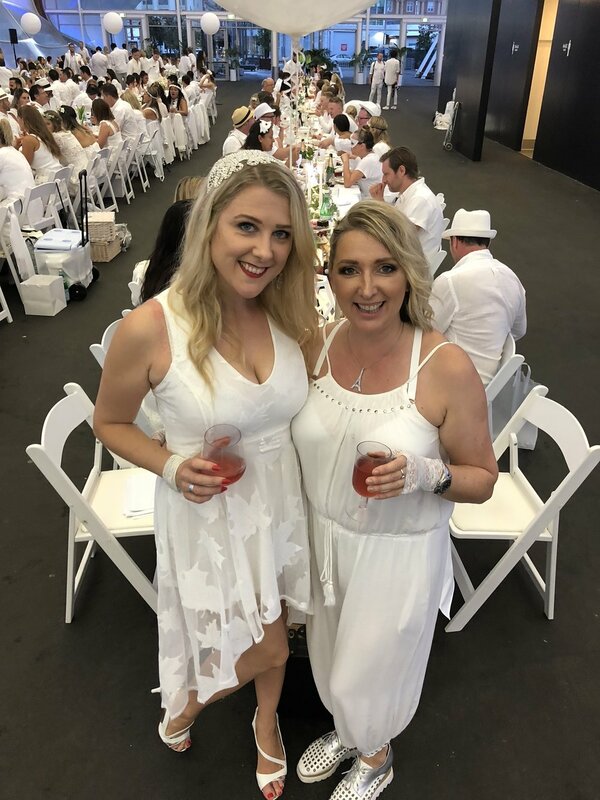 It’s no secret that Diner En Blanc is one of my favourite nights of the year. Most likely because I’m such a romantic & the thought of hundreds of people all dressed in their finest white outfits meeting to party at a secret location....well, it’s pretty fairytale. 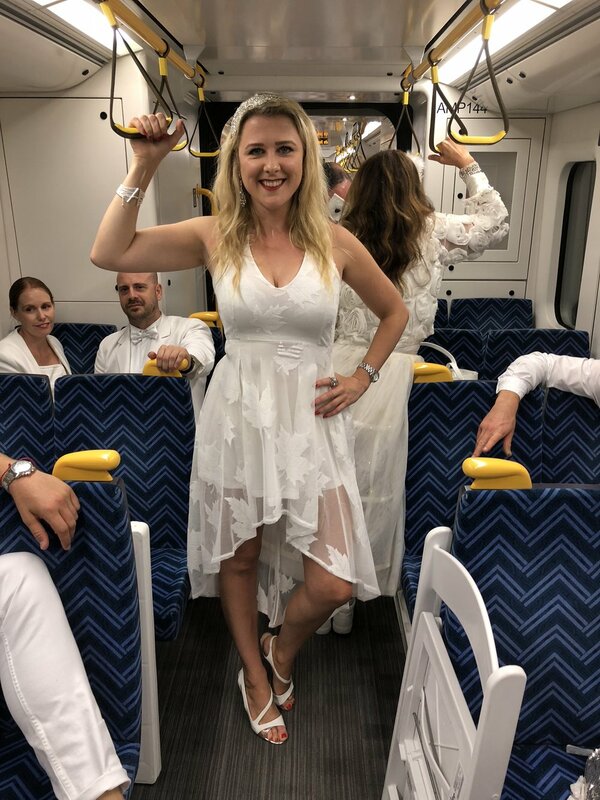 With the weather being a concern, I was relieved to find out that DEB Auckland would be undercover at The Cloud as while I had an amazing time at the historic "wet AF" DEB16, dry is definitely my preference. Having the event under cover is techincally bending the international DEB rules, but The Cloud is really just a big tent, right? The cool kids from Dry & Tea were there again to give any ladies requiring a hair refresh after lugging he whole picnic kit & kaboodle around town. (I love that!) and then it was just a case of setting up, greeting friends & fellow former DEB-ers (ended up sitting beside the same people as last year) and wait for the official start of the event which is represented by twirling of white napkins overhead. Once again the wine sponsors were Church Road & Perrier Jouet and, of course, the credenza was set up as a photograph/ insta story/ snapchat haven, there was one flawand that's that the Perrier Jouet light was so bright it completely dominated & washed out photos as it got darker, which was a shame as lets be honest, photos taken in this space are most definitely 'for the gram'. But if that's the only thing I can fault DEB18 for (and it is) then there is little to be upset about. Diner En Blanc always has a lot to live up to as I await it with anticipation every year, so the potential for disappointment is pretty high, but it has yet to fail me. The organisation is spot on, the venue was amazing, the crowd is always a great one, the entertainment is on point & it really feels like everyone is there to celebrate and have a good time. Have a look at the video below to see a one minute snippet of my personal Diner En Blanc experience. Being asked to drink vintage rosé Champagne, overlooking the ocean all the while celebrating a remarkable woman? That's the Mermaid trifecta....you couldn't keep me away if you tried. Veuve Clicquot Wine Maker Stephanie Roposte was in Auckland this week to celebrate the 200th year anniversary of Veuve Cliquot Rosé, the world's first rosé champagne made by one of the most innovative women in wine - Madame Barbe-Nicole Clicquot Ponsardin, the "Grand Dame of Champagne" who after her husband died when she was merely 27, took over the running of his Champagne house and turned it into the iconic, internationally renowned brand we know today. This would be no mean feat for a woman today but when you put it into the context that, at this point in history woman weren't permitted to own their own bank account, it makes the accomplishment of Veuve (French for Widow) Clicquot all the more significant. Apart from chatting & quaffing vintage Champagne - as in addition to the Non Vintage Rosé we were treated to couple of glasses of the 2008 vintage (2002 & 2008 are regarded as the greatest vintages of that decade), yes you can hate me now - I also got a chance to talk to Stephanie about what it is that makes Veuve Cliquot just so very special. So this Woman's Week I advocating for women everywhere to get together over a glass Veuve Clicquot Rosé, to celebrate the shift happening in our world today & to appreciate how lucky we are to have follow in the steps of women like Madame Veuve Clicquot. Thanks to the team at Dark Horse for the opportunity to come along & celebrate! Something kinda cool is happening a few flights of stairs above Britomart. The Aperol Garden is a little piece of Italian Heaven in the centre of the city. This pop-up which is only around until March 16th is on the deck at Ostro is is 100% dedicated to the the Aperol Spritz. There is no doubt about it the Aperol Spritz is enjoying remarkable popularity, however did you know that Aperol has been around since 1919, almost 100 years. In Italy the Aperol Spritz is the definitive Spritz, n Italian Spritz always has a bitter element as bitter flavours are the norm there. 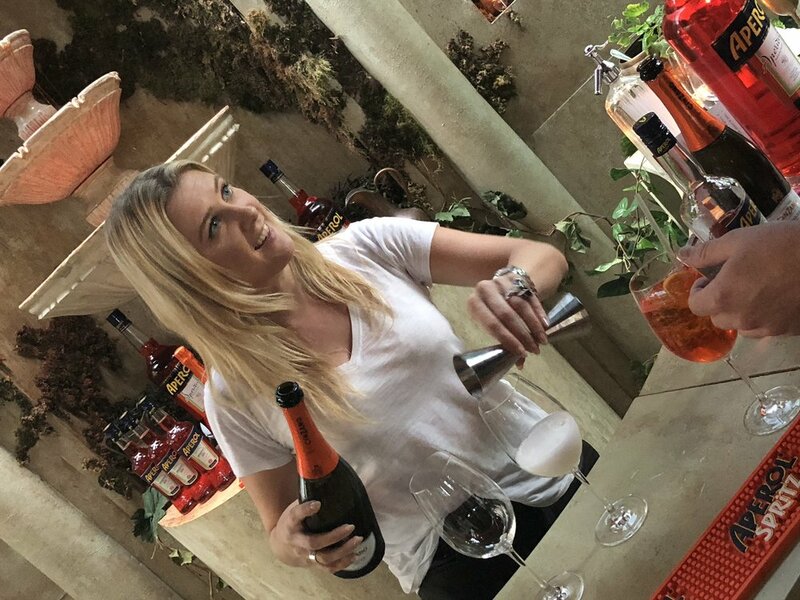 The other vital element is Prosecco, therefore for it to be a genuine Italian Spritz you should only use this style of Sparkling wine & no other. Last but definitely not least, the Aperol Spritz is a cocktail which is one standard drink, which at a time when we are moderating our alcohol intake and when drink driving laws are stricter than ever, it's pretty cool to have a cocktail that has less alcohol in it than a glass of wine. Head along to the Aperol Pop Up at The Deck at Ostro to enjoy your own delicious Aperol Spritz and a platter of Italian delights. They might even let you make your own Spritz if you feel so inclined! Take a sneak peak at the fun I had at this cool pop-up below. I have to admit to previously not even knowing that Te Wero Island was a place, I previously referred to it as "the place beside the bridge between The Viaduct & Wynyard Quarter". However right now this little piece of Auckland its kinda the place to be as there is an awesome new pop-up bar just in time for the Volvo Ocean Race boats to arrive. Wine brand Stoneleigh have pulled out all the stops to make an ocean-side garden paradise in the heart of the city, vine-covered archways, beautiful seating, trees, gravel, grass and even beanbags if you are so inclined (beanbags, great idea in theory, but just not when wearing a short skirt and there is absolutely NO elegant way to extricate yourself from a beanbag) anyhoo, I digress. The Stoneleigh Courtyard opened last week and like all pop-ups it isn't around for long, March 18th is the final day and this garden venue is a prime location for being in the centre of the excitement surrounding the Volvo Ocean Race as it's right beside the Ocean Race Village. Pop in and enjoy a yummy Stoneleigh wine (naturally) or a cold Peroni or indulge yourself at the Frose cart (coz - yes!) which is also in situ. The deliciousness is not limited to drinks, as a full menu is also available, which is no mean feat for a pop up. I have to say that if the standard of food is as good as we experienced at the launch then it comes highly recommended from me. Last week at the Stoneleigh Courtyard was my first trip but definitely won't be my last, I am heading down there for a delicious wine and some treats with friends next week to watch the world go by before this little city oasis is gone for good! For those of you who haven't been to Custom Lane it's a hidden gem in the heart of the city. Attached to the Grand Mercure Hotel, Customs Street during the day this sleepy little laneway serves coffee and doughnuts however at night for the next two weeks it is being transformed into a cool inner city pop-up cocktail bar hosted by none other than luxury French vodka brand Grey Goose. Each night of the week Grey Goose cocktails are being served with delicious French inspired food pairings available as well as a cool crepe station where you can get a deliciously decadent crepe made to order. This pop-up couldn't be better timed as the days are warmer & the nights are longer and sitting in this cool alleyway while the breeze blows through while enjoying a Grey Goose cocktail isn't to shabby a way to spend an Auckland evening! Combine that with the fact that DJ Karn Hall will be manning the decks on Thursday & Friday evenings and the real question is why wouldn't you check it out? We tried a range of cocktails on the night but the two biggest crowd pleasers on the night were the iconic Grey Goose Le Grand Fizz and the Grey Goose Espresso Martini. The Pop-Up at Custom Lane runs from Friday 24th November to Saturday 9th December every night from 3pm. Back for a third successful year the now well established Bombay Sapphire event has evolved once again. This year sees the Fresh Factory transformed into a hub of 5 international food stalls each matched with a Bombay Sapphire gin cocktail. The event is held over 5 nights only from November 1st - 5th inclusive &it is an event not to be missed. Take a tour around each of the stalls sampling culinary delights from Spain, Italy, Germany, China & Morocco each matched with a absolutely delicious & well matched gin cocktail. My favourite cocktail of the night was the cocktail from China, but my favourite food pick of the night came from Spain....coz who wants to play by the rules and put the suggested matches together? :) This is an event where there really is something for everyone to enjoy & did I mention they also have a "make your own" gin cocktail stall with G&T on tap.....now that's my kinda party! The Bombay Botanicals Bazaar is at the Fresh Factory, Nikau Street, Auckland now until Sunday & tickets available on iTicket now. Tickets include two dish and cocktail matches with additional meal/cocktail tickets available to buy either online or at the event. Do not miss this event! On a particularly miserable Auckland evening, we gathered at SPQR on Ponsonby Road to celebrate the launch of SOHO Wine Co's newest wine - Pink Sheep. A Rosé whose name is inspired by the extraordinarily talented designer Alexander McQueen who tragically took his own life after a battle with depression & anxiety at the age of only 40. To understand just why this charity is so important to the team at Soho - give my interview with Rachael Carter from Soho Wine Co a look, as she outlines just why this cause is so dear to her heart & why she - and the rest of the team at Soho want to make a real difference. How can you be unhappy when you have a perfect glass of pink Rosé in your hand? Let the wind howl (and it did!) we certainly didn't care. Rachael Carter - the MD of Soho Wines also announced that non-other than Raymond Chan had given Pink Sheep a 5 Star rating - this is not a rating that Raymond Chan (or any respected wine expert) gives away lightly, so yet another reason to get your hands on a bottle of this delicious Rosé. SOHO Wine have done something pretty cool, they have made an amazing wine (nothing new there for the team at SOHO) but this is a wine that is giving back & helping people. In our beautiful New Zealand we excel at many things, unfortunately, some of those things are less than great. NZ has one the highest suicide rate in the OECD and even worse this number is on the rise. This can't continue & one remarkable woman is doing something about it. Rachael Carter - MD for SOHO wines has seen first-hand the effect that depression can have on a family. Loosing an uncle to suicide & seeing "waterfall effect" that came as a result of that she is putting her money where her mouth is with regards to being part of the solution. Rachael is donating 50c from the sale of every bottle of SOHO Pink Sheep - the name by the way which is inspired by the late, great Alexander McQueen who himself struggled with depression & ultimately took his own life - to The Key To Life Charitable Trust run by Mike King - a man who is leading the way in keeping the conversation going, lifting the lid & changing (and I believe saving) lives. I sat down for a chat with Rachael & I was so inspired & moved by what she had to say. Having had my own journey with depression I am so proud of what Rachael & the team at SOHO wines are doing & I'm throwing 100% of my support behind them. Call round to see a friend with a bottle of SOHO Pink Sheep & ask them if they're ok...start a conversation with the person next to you in the liquor shop to ask if they're ok, or maybe just reach out and tell someone you're not ok.
Let's turn the tide on suicide & stem the loss of suicide. What's the quickest way to make a wine loving mermaid happy? Stick her on the ocean wave with a glass (and a few) of Rosé and some awesome fellow wine lovers. BLISS! I absolutely adore the "Isle Of Beauty' Rosé - it's bone dry and deliciously fruity. A very European style of Rosé with the lightest pink colour imaginable. Te Whare Ra have three very special new Single Vineyard releases. A Sauv unlike any other, a stunning Pinot & a breathtaking Syrah. I'm totally biased as I absolutely LOVE TWR but I just don't care. Can never keep my wine chats with Anna short as she has so much passion & amazing knowledge!